He has received everything from his ancestors - and proves to be an extremely worthy successor. Sezuan‘s Donnerhall, an incredibly beautiful dark chestnut stallion with strong limbs, outstanding paces and first-class rideability, won his 14-day test in Neustadt/D. (9.34) and his 50-day test in Schlieckau (9.19). The judges gave the perfect score of 10.0 for his canter, and 9.5 for rideability, willingness to perform and overall impression. His sire Sezuan achieved the unique record as a stallion of winning the World Championships for young dressage horses three times in a row, at the age of five, six and seven. His dam Siola also produced the licensed stallion Vivaldi’s Donnerhall (by Vivaldi). 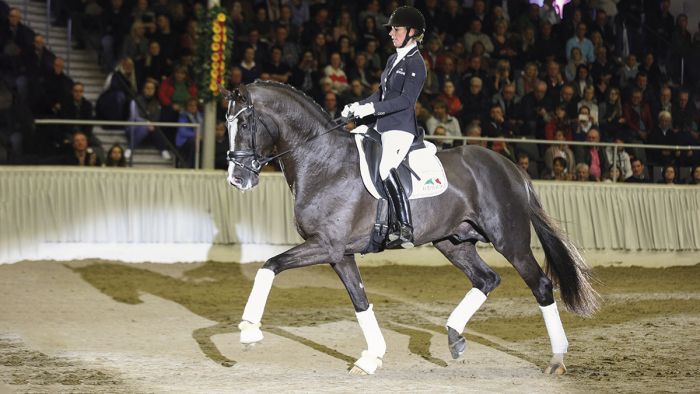 Her full sister Sibiola also produced a licensed stallion, Don Furitello (by Fürstenball). The dam sire Sir Donnerhall I has already earned the status of “trademark stallion“. Sezuan's Donnerhall is stationed at Deckstation Paul Schockemöhle in Mühlen.